Earlier this summer, Anna and I decided to get outside and float down the Neuse River. We had the opportunity to test drive a kayak on Falls Lake during a festival earlier in the spring and a trip down the river seemed like a fun way to spend a Saturday together. It was a great afternoon, even considering the surprise appearance by a slithering guest. Our swimming friends – not our slithering guest. 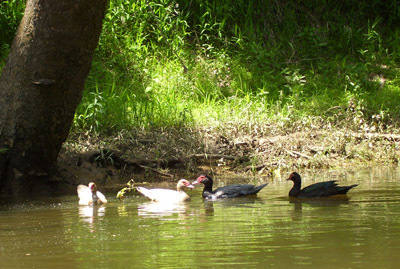 We headed out to Paddle Creek Outfitters, located just off Falls of the Neuse Road in Raleigh. They set us up with a tandem kayak, paddles, and life jackets. Debbie helped prepare a cooler with some lunch and, of course, packages of our gourmet cookies for this 4-hour tour. We loaded the kayak on top of our Honda Element and headed down to the entry point. It was a perfect day on the water. Not yet sweltering heat, but warm enough to make you feel good about being outside. Anna quickly learned how to use the paddles and we drifted slowly away from the dock, waving and looking forward to a nice afternoon together. We drifted for a couple of hours and then decided it might be time for a little lunch. I spotted what looked to be an abandoned picnic shelter just off the river and pulled the kayak onto the sand bar nearby. Having spent much of my youth around lakes and woods, I decided to hike up the bank and scout out the terrain first, just to make sure it was safe. I walked cautiously through the weeds to the picnic area. It was a bit dusty, but it was shady and seemed like it might make a nice place to rest and enjoy the lunch Debbie packed for us. As I turned to go back down to get Anna, I looked down at the path just before stepping on a snake that had made its way into the narrow clearing. I was close enough to get as good a look as I cared for at the time and am pretty certain it was a water moccasin, heading back down for a swim. The snake was directly between myself and Anna. The cell phone was in the boat. Fathers are not supposed to panic – right? I yelled at Anna and told her not to move from the shore while I looked for something to encourage this local resident to move along. I found a stick that was way too short and a chunk of wood. I eased into position behind the snake and carefully tossed the chunk of wood just to the right of the snake, hoping he would opt for an exit, stage left, and not force me to use the stick. As luck would have it he complied and I sprinted down to the boat quick enough to make an Olympic coach proud. Anna and I agreed that lunch in the boat seemed like a good idea, so we quickly hopped in and shoved off back into the water. The ‘Master Dad’ avoided an incident and managed to use this experience to offer up a few lessons for Anna – don’t panic (or at least don’t let anyone know), stay calm, and watch what is going on around you. Anna’s Gourmet Goodies affords us the luxury of having my daughter around most of the day while we work – thanks to our wonderful customers. It has truly been a blessing to be able to watch her grow up. But finding time to talk does not come easy when you run a business. There’s always something to do, emails to answer, phone calls to return, website updates, or whatever. Being out on the water, in the boat, was just about the perfect way to spend time talking, listening, and re-connecting. It was a reminder just how important it is for us to ‘disconnect’ from the frantic pace of our everyday life and spend a little time outdoors with the folks who matter the most. Hopefully you have found time to get outside your ‘work zone’ this summer. If you haven’t, there’s still time before we get too busy with school, holidays and work. I highly recommend kayaking, just watch where you step should you venture off into the weeds.